Sausage and parmesan complement this pizza nicely. Contrary to what the United States Congress declared several months ago, pizza is not a vegetable. That’s not to say that pizza can’t be relatively healthy, though. In fact, there are plenty of recipes that involve wholesome ingredients and can also be vegan-friendly. This is one of them. I myself (not being at all discriminatory in my diet) like to add a bit of cheese or throw some meat on as a topping, but it’s totally up to you. Customize as you see fit. After all, that is the best thing about pizza. And if you’re not so much into the whole pizza thing, this pesto goes great on pasta too. Step 1. If you have a blender or food processor, throw in the spinach, garlic and herbs all at once, adding the olive oil gradually. If your kitchen is more lo-fi, use a decently sharp knife to chop everything up as finely as possible. Then mix it all up in a bowl. Add a pinch of salt and pepper, and some grated Parmesan if you’re so inclined. Step 2. Now for the pizza dough. 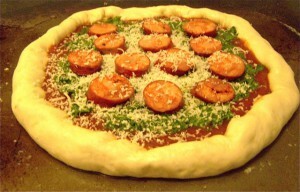 For beginners, I suggest just buying a ready-made pizza base at the store. If you’d rather make your own, it’s not at all difficult. Food websites like epicurious.com and allrecipes.com have some really simple recipes. Step 4. After you’ve made the difficult decision of choosing a topping (or not), grease a baking sheet with olive oil (and/or cornmeal) and throw the pizza on top. Preheat the oven to 425 degrees and bake for about 15 minutes.